You can add files to OneDrive in many different ways and then get to them from anywhere. 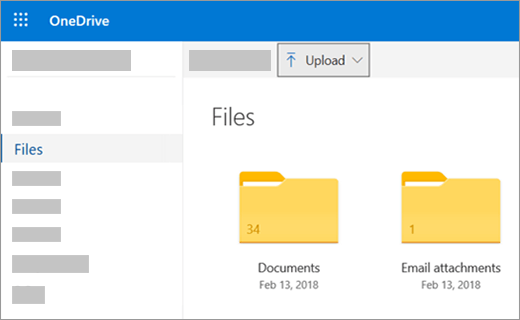 Note: For transferring large files or lots of files, we recommend adding the files to the OneDrive desktop app rather than using the Upload button on the website. On the OneDrive website, sign in with your Microsoft account, and then browse to the location where you want to add the files. Select the files you want to upload, and then select Open. You can also drag files from File Explorer or Mac Finder straight to your files on the OneDrive website. In the Google Chrome or Microsoft Edge browser, you can also upload folders from the Folder option on the Upload menu, or drag folders to the website. Learn ways to organize and find photos in OneDrive. For both File Explorer and Mac Finder, if you want to copy the item rather than move it, right-click the file or folder and select Copy, then open the OneDrive folder (or sub-folder) and right-click > Paste a copy of the item to OneDrive. To move a file using Windows File Explorer, drag files from the file list in the right pane to OneDrive in the left pane. 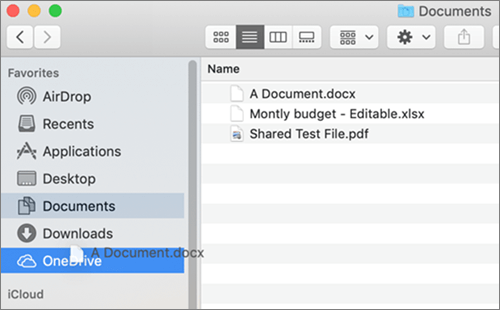 To move a file using Mac Finder, drag files from the file list in the right pane to OneDrive in the left pane (if you have OneDrive listed there under Favorites). After a moment, Finder will switch to show your existing OneDrive files and folders in the right pane, and you can drag the file into the sub-folder of your choice. In new installations of Windows 10 for many eligible users, files save to OneDrive by default in Windows 10, rather than to your PC. This means you can access those files from any device that can connect to the Internet, and they are protected in case your computer is ever damaged. You can change your default save setting anytime. 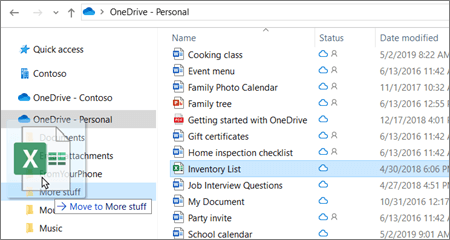 Learn how to set where your files are saved or move your files to OneDrive. You can save directly to OneDrive from Microsoft Office files (like Word docs and Excel worksheets), PDFs, and other documents. If your PC has a built-in camera, you can automatically save copies of the photos you take directly to OneDrive so you’ll always have a backup. To make sure your PC is set up to save automatically, check your OneDrive settings. For documents, select OneDrive, and then turn on Save documents to OneDrive by default. For photos, select Camera roll, and then choose Upload photos at good quality, or for higher resolution copies, choose Upload photos at best quality. When you move files, you're removing them from your PC and adding them to OneDrive. Select the arrow next to OneDrive and choose This PC. 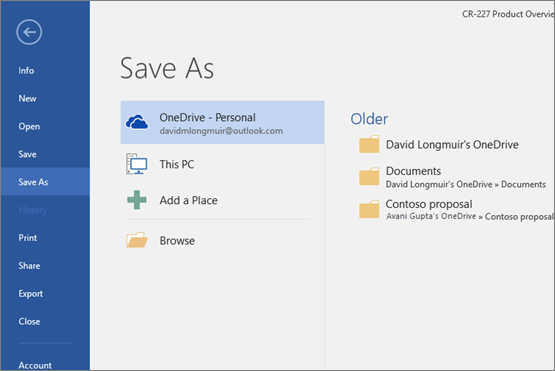 Select the arrow next to This PC and choose OneDrive to browse to a folder in your OneDrive. Swipe in from the top or bottom edge of the screen or right-click to open the app commands, and then select Paste. If you have Windows 7, Windows Vista, or a Mac, you can install the free OneDrive desktop app to upload files and folders to OneDrive automatically. Files you upload using the desktop app can be up to 20GB in size. In any Office document, select File > Save As, choose your OneDrive, and then pick the folder where you want to save the file. Microsoft might limit the number of files that you can upload to OneDrive each month.